→Atom Drop-Through Longboard Review – Something for Everyone! Atom Drop-Through Longboard Review – Something for Everyone! The longboard marketplace is choked with cheap boards, gathering dust on shelves in warehouses until some poor sap makes the mistake of clicking the buy button. As a beginner, it can be a tall task to separate the crap from the bargains. Atom longboards are vying to be known as the latter. Most complete board setups contain a mixture of quality and generic components; the trick is to figure out what upgrades will need to be made and which components might last a while. Most complete board setups contain a mixture of quality and generic components; the trick is to figure out what upgrades will need to be made and which components might last a while. Like most longboards targeted at the beginning rider, Atom longboards are a mixed bag when it comes to their parts, but they are priced closer to premium longboards. Read this Atom drop-through longboard review to see if they warrant their price tags. 3 Is a Drop-through for You? 4 What Are The Alternatives? The maple in the Atoms drop-through deck is decent. Though not artisan-quality wood, it will suffice for a beginning skater and should last. While some new riders complain about the concave, it helps lock your foot in place and is more comfortable than a flat deck. The wheels are a little better than okay, but the 78a hardness will likely be a “Goldilocks” durometer for a new rider — soft enough for comfort and hard enough for some sliding and decent longevity. It is uncommon for the grip tape to be a positive in an off-the-shelf board, but the Atom’s coarse-grit grip provides good traction, instilling confidence in a beginner, and should wear evenly and gradually for a long life. One of the main purposes of a drop-through board is downhill riding, but with the Atoms’ camber and some models’ tendency toward speed wobbles, this becomes a questionable idea. The camber likely provides the extra flex that bothers some buyers. The generic trucks also come with bushings that are on the soft side, yet brittle (an odd combination). The models with Navigator trucks are more stable and have better components. A common complaint is Atom’s use of non-standard hardware, and rapidly loosening nuts that don’t fit a skate tool. High-quality hardware is a cheap and easy fix, though. And, while the ABEC 9 bearings provide decent speed, some models contain lower-rated bearings. Either way, an upgrade will bring these longboards to life. Is a Drop-through for You? Drop-through longboards are often used in downhill and freeride skating, with the low height aiding in stability at speed. Even if you never plan on sliding or bombing a hill, though, the length of the board and the low ride are comfortable for long-distance commutes. As an around-town cruiser, the drop-through excels, though the larger sizes can be a problem if you need to put it away when you get somewhere. The Atom drop-through longboards accomplish each of these riding styles admirably, though the generic trucks are not ideal for downhill riding. With the Navigator Drones installed, however, they can provide at least a taste of the rush of downhill riding to adventurous beginners. This video on YouTube shows the Drones in action. If you’re considering getting an Atom drop-through, you should examine the components in the model you like. The boards with art graphics tend to have better components, but this is not always true. Atom’s real competition, which includes longboards like this Santa Cruz Rasta (Link to Amazon.com), is typically priced a bit higher. The Santa Cruz comes with OJ II wheels (a skateboarding classic) and Road Rider trucks. That said you will pay a premium for them. You can read our full review of Santa Cruz longboards here. Boards with prices below an Atom are usually cheap for a reason. Of course, within the Atom drop-through lineup there are price differences, and not simply because of components or art graphics. This Atom drop-through 40-inch Owl comes with the Navigator Drones, while this 36-inch with lion graphics comes with the generic trucks. There are even differences with boards at the same price point. This yellow Atom 36-inch drop-through team board, for example, comes with ABEC 5 bearings; while this blue one comes with ABEC 9s, and the price difference is negligible. The Atom drop-through decks all have a few things in common. They are all 8-ply maple laminate and have a small amount of camber with decent concave. The grip tape coarseness differs from model to model, but they are all relatively coarse. Super High Rebound (SHR) wheels are common across the line. The colors vary, but they have a 78a durometer, 70mm height and 51mm contact patch in common. The trucks are where things start to vary between the models. Some of them have generic, 9- to 9.5-inch aluminum trucks, while others include 7-inch Navigator Drones. The drones are a considerable upgrade, with bushings that beat out the cheaper, generic version’s and a solid feel that the lesser option cannot match. Read the fine print carefully! The bearings are either ABEC-5, ABEC-7 or ABEC-9. There is no apparent method to Atom’s choices for this component — so read the fine print carefully. For the cost of admission, an Atom drop-through longboard is hard to beat. 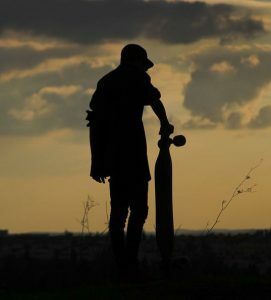 As an entry into the world of skateboarding, Atom longboards provide better quality than their dirt-cheap counterparts, while keeping prices reasonable for someone who doesn’t know if they are purchasing a floor ornament or something they will actually use. The complete setups just above the Atom line in pricing use components that are that much better, but they may be lost on a new skater and can be purchased later as upgrades in needed. No matter the model, an Atom drop-through will provide a great platform for learning and experimenting with several longboarding riding styles. It may not be perfect for any of them as is, but with just a few tweaks you can have a decent setup for any of a few disciplines. If you do your homework, you can find an Atom that you can live with.